Finding an expert coach that is the right fit for your individual needs can be a challenge. To simplify your search, we have released the new and improved Coach Search. With more than 1,000 coaches from 56 countries, the new Coach Search will find the right coach for you whether you are just starting out or are an elite athlete. New features allow you to perform detailed searches and quickly view coach profiles. No matter what your goals are, a coach will provide the personalized planning, motivation, and guidance to achieve your goals. The new advanced search has been updated to be more user friendly and allows you to use keywords or phrases to find the coach that fits your needs. Refine your search even further by selecting from filters like sport type, services, your ability level, location, language, and more. 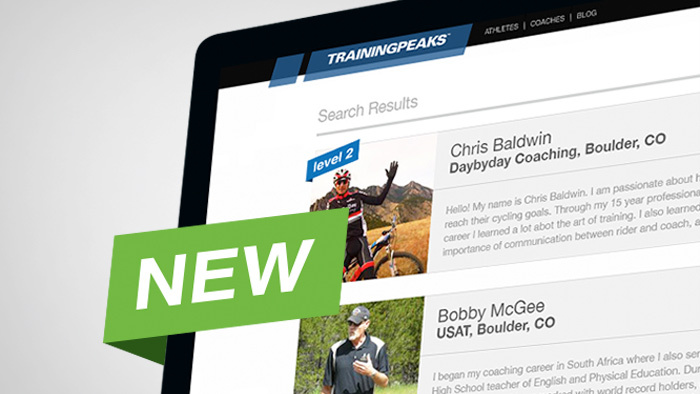 Each coach’s profile now includes their qualifications, bio, location, services offered, preferred athlete levels, and indicates if they are a TrainingPeaks Certified Coach. If you are interested in learning more about a coach, you can reach out them directly using the contact form and they will be notified of your interest. You can also click through to their website and social media channels if available. If you want more personalized assistance in finding the perfect coach, our Coach Match Service will connect you with a hand-selected TrainingPeaks Certified Coach. All TrainingPeaks Certified coaches have demonstrated their expertise as a triathlon, cycling, or running coach. Your goals are important, and finding the right expert is the best way to achieve them. The new Coach Search is your resource to find that coach. Find the right coach today.